A relatively quiet start to trading this morning for binary betting ahead of today’s busy economic calendar, and in the forex markets there is a sustained and clear move away from the high yielding currencies of New Zealand and Australia. In early trading today the New Zealand Dollar vs US dollar pair is down by 0,75% whilst the Aussie dollar agains the Japanese Yen has fallen by 0.5%. 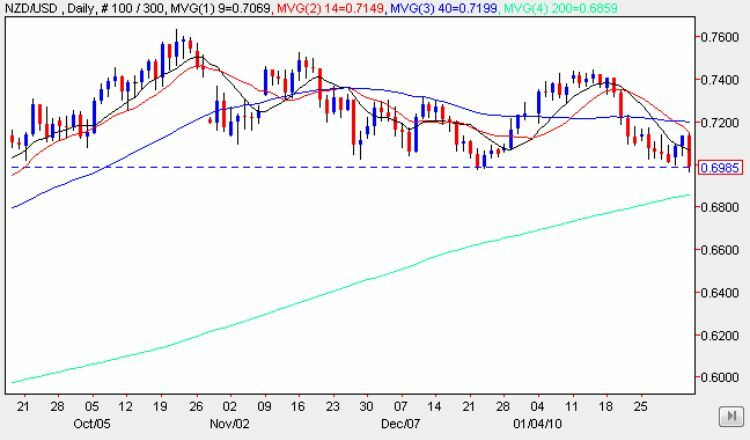 The Aussie dollar came under further pressure today with the release of the retail sales figures which came in worse than expected at -0.7% against a forecast of +0.3%. At the same time the New Zealand Dollar fell following release of the Unemployment figures which came in higher then expected at 7.3% against a forecast of 6.8%. With sentiment now turning against these high yielding currencies as the carry trade speculators begin to panic and sell off in ever larger volumes, today will be seminal for the NZD/USD currency pair, as technically the pair are balancing on the edge of support in the 0.70 price point. With the level of news today this could trigger a break below, providing several binary betting opportunities as a result, and for fixed odds trading I would suggest a double down bet as the best trading strategy for today. Longer term, if this support region is penetrated then a no touch bet at this level would then be the appropriate binary betting strategy.